If you have been convicted of a crime you are not protected from the laws that protect other workers from involuntary servitude or slavery. Thus, all over the United States, thousands of prisoners are toiling for little or no money against their will in prisons. According to the International Labour Organisation the wages paid to prison labourers range from about 23 cents to $1.15 an hour before tax. Once taxes and other deductions are paid, many of which are highly dubious deductions such as so-called “fines” and administrative fees, the prisoner will often have no money or leave prison owing money. A 2010 study by the Brennan Center for Justice found that states and counties are increasingly imposing “per diem” fees on prisoners, resulting in some inmates going into debt by the time they are released. 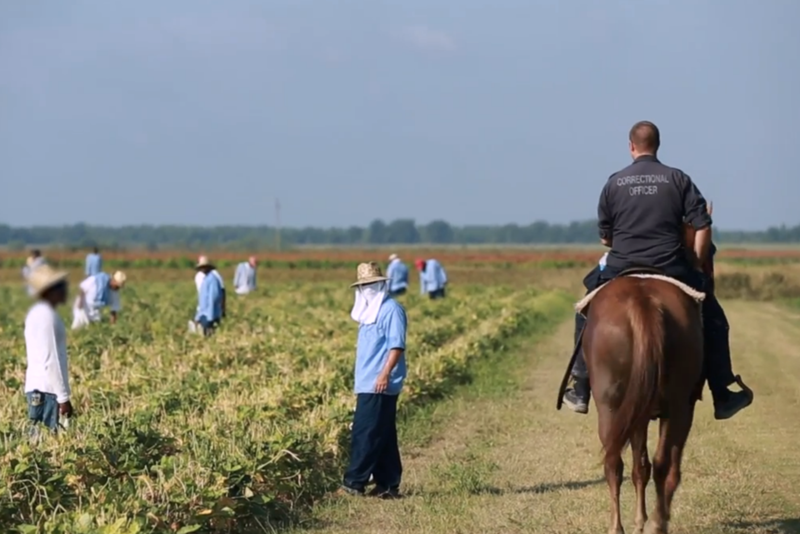 In some states, such as Arkansas, Georgia and Texas, prisoners receive no money whatsoever for their labour. Most prison labour is deployed in the day-to-day running of the prison, such as cleaning, laundry and kitchen duties, running the libraries and other such tasks, but a large amount of prison labour is being contracted out to private companies where the workers are forced to work for long hours with little, or no, compensation under conditions that are often dangerous. One of the biggest advantages for companies using prison labour is they get a work force that is not only compelled to work for them but they can’t complain as their working conditions are not covered under the Fair Labor Standards Act because the courts don’t regard the prisoners as employees for the purposes of this law. To make matters worse, as reported by the American Prospect in its investigative report “Modern Day Slavery In America’s Prison Workforce” (May 28th, 2014), the labour unions won’t represent prison workers because they produce goods that compete with other industries. Or, to put it another way, prison workers undermine the working conditions of other workers because they produce goods that can be made cheaper than those produced by companies that have to deal with irritations like minimum wages, working standards, health and safety issues and other such stuff that the capitalist classes are always moaning about. Well, that may be the case in theory but the more brutal reality is that many prison workers were not unemployed before they arrived in prison and the skills they learn from prison labour does not always provide them with the skills they need to re-enter the work place once they have been paroled. That’s because a lot of the work is menial labouring and other make work schemes that are often jacked up between cash-strapped not-for-profit organisations and government agencies that anyone familiar with the so-called “work for the dole” schemes used in Australia and New Zealand on and off over the years would be all too familiar with. Another big problem with the use of prison labour is that it is a breach of international law. Article 4 of the Universal Declaration of Human Rights, of which the United States is a signatory to, states: “No one shall be held in slavery or servitude; slavery and the slave trade shall be prohibited in all their forms.” Yet, it would appear that if you are unfortunate to be arrested and jailed in the United States you will be subjected to slavery or involuntary servitude. What is interesting was the weasel words used to excuse the United States’ use of forced labour by the article writer Sophia Yan: “Unlike China, the U.S. doesn’t deny that prison labor is taking place. Detainees are subject to a more transparent judicial process and review than in China, where the legal system can be opaque and confessions are sometimes coerced.” As noted above forced labourers in the American prison system don’t have any rights because the laws that protect most American workers don’t apply to prison workers because they are not regarded as employees for the purposes of the Fair Labor Standards Act. It’s also a very piss poor argument to claim that the United States using prison labour is okay because they are open about it but it’s wrong for the Chinese government to do so because they aren’t. The point is that slavery of any sort is wrong. It’s wrong from an international law perspective. It is wrong from a moral perspective. It is wrong even under United States law. Yet the United States allows the use of forced prison labour – slavery – because of some highly dubious arguments about how work is benefitting the prisoners for that day in the future when the prisoner will be paroled. Perhaps a more telling statistic is one that Mother Jones slipped in about who really benefits from the use of prison labour. According to their September 19th, 2016, article about the prison worker strikes Mother Jones stated that “prison workers reportedly helped Florida taxpayers save more than $59 million in 2014”. So the state, which is supposed to be protecting its citizens from exploitation, is actually participating in the exploitation of the working class in order to trim the tax budget! It does not require a PhD in Economics to work out who the real beneficiaries of forced prison labour really are. It’s the business owners who use prison labour costs to undermine the wages and conditions of the working classes and to undercut their competition by means that are blatantly illegal, underhanded and unfair. It’s the taxpayers who get their precious taxes reduced because the people providing the services paid for through their taxes don’t get paid and don’t have any working standards or legal protections. The only people who don’t get anything good from this arrangement are the workers themselves. They are losing their jobs because the businesses and other organisations they work for can’t compete with the companies and county and state government agencies using prison labour. “Workers of the world, unite! You have nothing to lose except your chains!” It’s become a cliché but it is also true. In the case of prison workers in the United States, China and other countries the chains are not metaphorical but quite literal. The workers of the world must not stand for this shameful exploitation of the most vulnerable. We must not allow the American labour unions or the United States government to use weasel words to excuse doing nothing to protect prison labourers from being exploited. Slavery, involuntary servitude and any other form of compulsion in the workplace is an affront to all humanity and must be opposed by any means at our disposal. It is not acceptable to be silent when workers are being forced to work in conditions that even the mainstream media is calling modern day slavery, in a country that claims to respect human rights and the rights of the individual. Just as I was about to sum up this article I read that, according to the Free Alabama Movement, which is one of the groups organising the prison strike that prison guards have started to join the strike. (Free Alabama Movement website, September 26th, 2016.) They, too, have began protesting against the conditions in prison including poor pay, overcrowding and human rights abuses. As of the time of writing the strike is still under way. About 40 to 50 prisons in 24 states are involved to varying degrees in the prison strike, according to Ben Turk, who works for the Incarcerated Workers Organizing Committee, a chapter of the Industrial Workers of the World. There is no indication that either state or federal authorities have made any changes nor intend to make any changes to these conditions. This is not a surprise to anyone. However, it remains to be seen what developments will arise, if any, from the prison strike in the United States. 2. The Largest Prison Strike in U.S. History Enters Its Second Week, The Insider, September 16th, 2016. An excellent article about a truly horrible situation. Solidarity with our incarcerated fellow workers. But, um, the "International Workers of the World"? Seriously? Excellent article, the only mistake is that IWW is "Industrial Workers of the World" not "International Workers of the World". Solidarity!